As bad weather and dangerous driving conditions have impacted most of the country, businesses and schools have shut down to ensure the safety of staff, students and potential patrons. Not the Panama City, FL. court system. On January 30th, 2014, and in an effort to minimize the requirements of travel in poor weather conditions, Panama City officials ordered all hearings on that day to be conducted via videoconference. 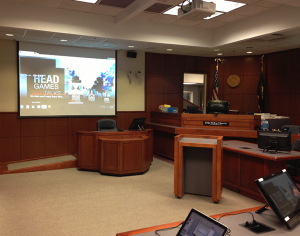 Parties and legal counsel were given the option to appear in the courtrooms in Tallahassee or Panama City, Florida, or simply participate in the proceedings via live videoconferencing. The use of VC technology by the courts continues to expand – from depositions and witness interviews to now helping to circumvent the power of Mother Nature, the use of videoconferencing technology continues to prove beneficial and a necessary tool for today’s courtroom environment. Trinity Video Communications has partnered with many legal entities – court systems, law firms and not-for-profits – to develop and implement state-of-the-art presentation and video systems, including the Jefferson County Upgrade Project (pictured), which improves communication and information sharing within 13 Jefferson County courtrooms [Read more about the Jefferson Courtroom Upgrade Project (JCUP) at https://www.trinityvideo.net/attorney-law-magazine-tells-jcup-trinity-story/. If you have questions about videoconferencing for your court system, ask the experts at Trinity. Trinity Video Communications provides the most cutting-edge videoconferencing technology, including software-based solutions and BYOD videoconferencing for commercial, healthcare, legal and law enforcement, education and government applications. Trinity is based in Louisville, Kentucky, with additional offices in Cincinnati, Ohio and Sterling, Virginia. To learn more about how Trinity can transform the way your organization communicates, contact a representative today at 800-261-9008 .